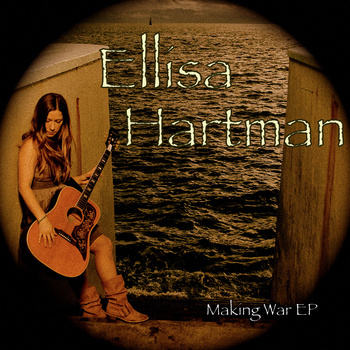 Well Ellisa Hartman is fast becoming an Island SoapBox favourite, and the Making War E.P. has strengthened her case. I remember her excitement for the release, and I can understand why. The 6 song E.P. is a great showcase of her talents, and should please current fans as well as intrigue new ones. "Making War" and "Smitten" are probably the two catchiest tunes on the album. Both make you want to sing along, and I think these two will catch your attention and really allow you to enjoy the rest of the album, which rings along at a slightly slower pace. As it's 6 songs, it's a quick play, but an enjoyable listen that will leave people searching out more Ellisa Hartman. She is another musician on Vancouver Island who is just so incredibly personable, you want her to succeed. This album is definitely a strong performance, and I think demand for this now Campbell River based musician should be on the rise. Look for an interview in the coming weeks with Ellisa!